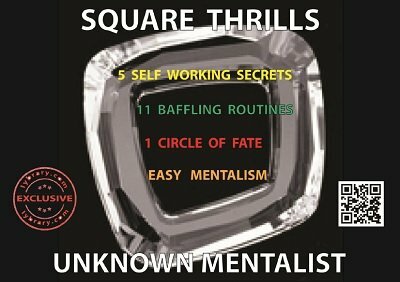 If you already own Square Skills or purchase along with this, you can get this ebook for $6 only. And the owners of this ebook can get Why A Magic Square Should Not Be a Magic Square for half price. Many enigmatic secrets. Hidden deep inside the 'Circle of Fate' for many centuries. Now rediscovered, repackaged and revealed for you. You will learn 5 simple, self working secrets of the 'Circle of Fate'. You will also learn 11 stunning routines. You also get the 'Circle of Fate' printable prop. Fully automatic and self working routines. So you can fully focus on your presentation. Very novel presentations are included along with scripting and patter. Easy to do routines. You can start doing the routines within 10 minutes of reading the instructions. No stooges. No sleights. No pre-show. Finally, you will enjoy performing these as much as the audience will enjoy watching them.